By planning a destination wedding, you are already committing to go outside of the general wedding planning “box.” So why not continue with adding an element to your wedding ceremony content that is as unique as your love? Since we’re local and destination wedding photographers and own, Photos by Miss Ann, we have witnessed endless amounts of ceremonies that draw in religious, cultural, and spiritual elements and have seen them done in a hundred of different ways. Think: unity candle, tying the knot ceremony, sand ceremony, Irish braid, crowning, hand ceremony, etc. When we were planning our destination wedding we were looking for an alternative for our Iceland wedding. After researching back into historical wedding ceremonies, we found it: The Love Letter Ceremony. It gracefully combined our affection for history, our love for each other, and provided a piece of our own history with our parents as well. How you felt when you met. How much you have grown from then to now. Your feelings as you anticipate your wedding day. Your wishes for your future together. The bride’s parents write a letter directly to her only. Expressing their excitement for her arrival, her childhood, successes, how proud they are, advice, etc. The groom’s parents write a letter directly to her only. Articulating their excitement for his arrival, his childhood, successes, how proud they are, and advice, etc. Each set of parents then write a letter addressing the couple together stating their excitement for finding each other, the marriage, wishes for the future, and words of wisdom. How amazing, right? It gives me goose bumps just thinking about reading them as we celebrate our 25th wedding anniversary when our parents may have passed and we may have a family of our own! This is a very special ceremony I believe has an enormous long-term impact to all. We hauled the box from Plymouth, Michigan to Hella Iceland to our wedding ceremony at Seljalandsfoss waterfall, then to Skógafoss waterfall and finally out to Vik Beach for Iceland wedding photos and a champagne toast! Buy or build a box that will be big enough for letters and additional mementos. We had an 8×11 box that was ~3 inches wide. This was big enough for our letters, vows, speeches, our bouquet/boutonniere when it dried out, etc. It was travel friendly. We brought from Michigan to Iceland with no problem. Some people like the idea of it being large enough to house a bottle of wine/champagne and wine glasses – your choice! Purchase super cute acid-free stationary. Ours was white with a simple red heart at the top and a matching red envelope- Etsy may be a good source for you on this. Plan what you are going to write at least 30 days in advance! Give your parents time to plan and write too! 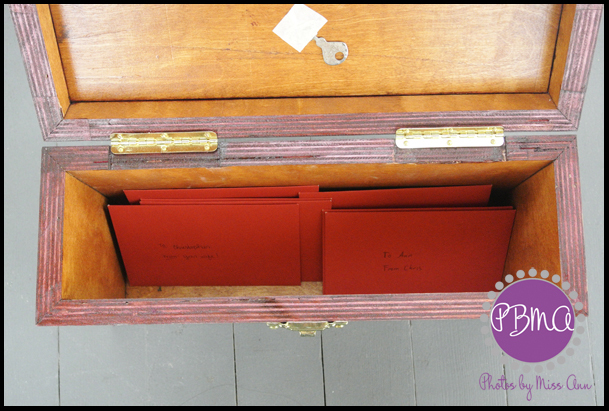 Get the letters in advance and put them in the box for safe keeping until the ceremony. “Christopher and Ann have chosen as a couple to unite together in a Love Letter ceremony. This box contains a love letter from each to the other. 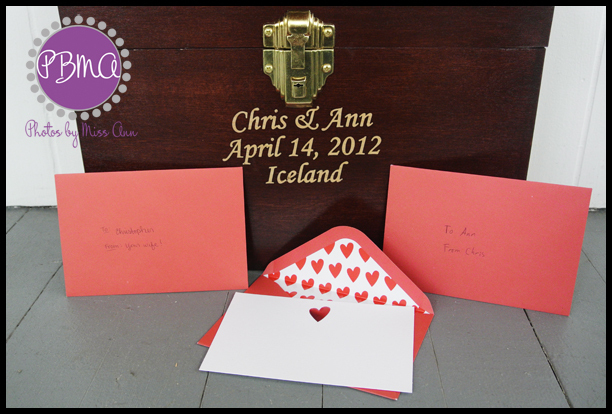 The letters describe the good qualities they find in one another, the reasons they fell in love, and their reasons for choosing to marry today in Iceland. Ann’s mother, Irene and Christopher’s parents, Donna and Bill have also written the each a letter individually and a letter to the couple expressing their hopes and advice for their future together. The letters are sealed in individual envelopes and the couple has not seen what the other has written. Christopher and Ann, should you ever find your marriage enduring insurmountable hardships, you are to as a couple, open this box, reflect while reading the letters you wrote to one another when you were united as a couple, in marriage. By reading these love letters you will reflect upon the reasons you fell in love and chose to marry each other here in Iceland today.